The Minicom 0SU60001 is a DX User Unit for the DX matrix system. The Minicom DX system gives you a highly secure, integrated, flexible and supremely scalable solution for 24x7 BIOS-level control and management of high-density mission critical server environments. 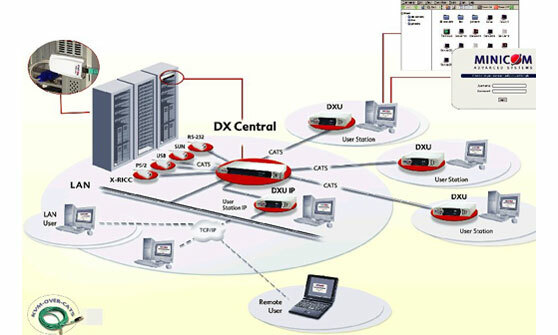 The DXU user unit enables analog KVM capability up to a distance of 100m from the DX central unit. The optional DXU IP user unit (sold separately) enables remote digital KVM/IP capability from anywhere in the world over the LAN or WAN supporting 128-bit SSL encryption. Question: Is there a compatible replacement for DXU User Station ? I need a spare and cannot find anywhere. Answer: Unfortunately, this part has been discontinued and there is no replacement to it. Tripp Lite is currently searching for any possible leftover demonstration units or any other supplies. We will let you know if we are able to find anything. If this does not yield results, your best bet would be to find one used or refurbished online.